Reality requires that, at times, we leave our greyhounds to the care of others. Anyone who has a clingy,”Velcro-dog” like mine can appreciate the importance of finding a reliable, trustworthy pet-sitter, someone on whom you can rely to give TLC as well as basic care. The purpose of pet-sitting is to keep the dog’s environment as close as possible to when you are home. Recently, I had to go on a two-day business trip. Rather than leave my Grey, Duffy, alone for most of the day and make him wait until my husband came home from work to take him for his daily walk I decided to hire a local pet-sitter (Robin Fry of Robin’s Companion Animal Home Care) to do this task. Because I was very impressed with Robin’s services, I decided to interview her and pass on her knowledge of the business to you. 1. have at least some basic knowledge and/or training in veterinary care. This is critical because a trained pet-sitter can recognize subtle signs of illness or distress in the animal that might otherwise go unnoticed until the owner returns. The pet-sitter should be interested in updating his/her knowledge and willing to take suggestions and heed instructions carefully. 2. be fastidious about and concerned with the transmission of bacteria, viruses and parasites. Reliable pet-sitters take precautions and do not simply go from appointment to appointment. Precautions include doing a surgical scrub between clients, treating every condition as if it were contagious, and refusing to take on clients whose animals have contagious conditions (i.e.,feline distemper or parvovirus) because of the risk to the other animals with which the pet-sitter will have contact. 3. have access to emergency veterinary services and leave detailed notes (similar to nursing notes) to tell you exactly what happened while you were gone — what might seem like nothing, can be significant. This also shows that the pet-sitter cares about the animal. 4. should be bonded and insured, should empathize with the animal and its family and treat animals with respect. The individual should be happy to help you find other accommodations if it turns out that she/he cannot or does not feel able to handle your pet and should be familiar with other pet sitter and boarding kennels in your area. 5. be veterinary-endorsed. If the pet-sitter has pets of her own, ask for her veterinarian’s name and find out what kind of care she gives her own animals. 6. give you a list of references. A pet-sitter who refuses to give references for “confidentiality issues” is a “red flag.” Follow up on those references. 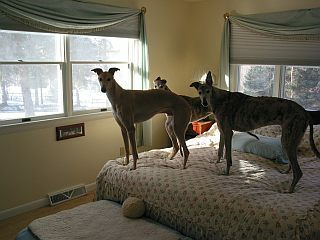 7. be knowledgeable about Greyhounds. Be sure to explain the importance of never allowing a Greyhound off-lead and explaining about the “chase” instinct,for instance. What a reliable pet-sitter should ask you. 1. What is your dog’s normal feeding and elimination schedule? What brand of food does your dog eat? 3. How does your dog behave when you are away? 4. Are there any health concerns and/or problems that your dog has? Any medications? When was your dog last vaccinated? What diseases was your dog vaccinated for? 5. Does your dog have a favourite toy? Favourite place to sleep? What makes your dog tick?